When Steve Kootenay-Jobin watched the Treaty 7 and Métis nation flags rise at Mount Royal University this past November, it was more than a symbolic gesture to him – it felt like a major step towards reconciliation. The flag-raising marked the roll-out of the university’s Indigenous Strategic Plan and will fly permanently on campus. 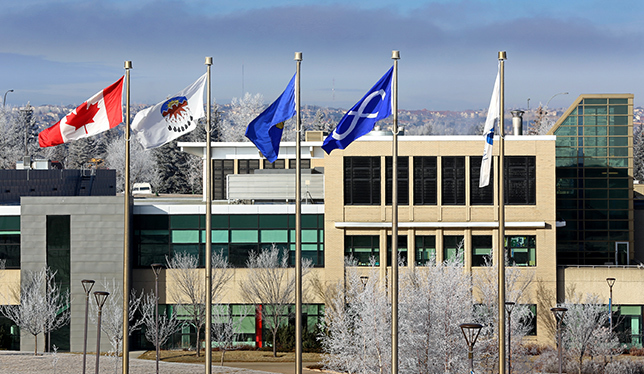 The Canadian, Treaty 7, Alberta, Métis, and MRU flags flying at the university. Photo by MRU. She approached Mount Royal president David Docherty about it. Dr. Docherty acknowledged that he had wanted to fly the flag for some time, but administrators were having trouble deciding which ones would best suit the campus. Ms. Merrill turned to the Iniskim Centre for guidance and director John Fischer suggested the addition of the Métis flag to reflect a large number of the school’s Indigenous students.